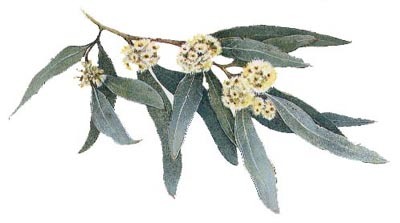 Medicinal uses: A traditional Aboriginal remedy for infections and fevers. The herb is an antiseptic and is very helpful for colds, flu, and sore throats. A strong expectorant which makes it useful for chest infections including bronchitis and pneumonia. The diluted essential oil, applied to the skin as a chest or sinus rub, has a warming and slightly anesthetic effect, helping to relieve respiratory infections. This can also be experienced by using an infusion or tincture as a gargle. The diluted essential oil can also be used for pain relief. It can be applied to the affected area to relieve rheumatic joints as well as neuralgia and some bacterial skin infections (Chevallier 98). Additional uses: The dried leaves and small branches can be used in potpourris as well as in flower arrangements (Kowalchik 186). Cautions: Do not give to small children or infants (Chevallier 98).